We have done a lot on researching a good wireless charger, from the material to the adhesion details, every part were firmly held under control. This wireless charger is a universal one which can be compatible with all Qi enabled devices with size ranging from. Item comes with two mount: A Air Vent holder and a dashboard bracket base(Suction Mount), you can place them wherever you like and adjust the angle. For Fast charge mode, QC 2.0/3.0 adaptive fast charger requires a QC 2.0/3.0 adapter as its power source(car charger included). 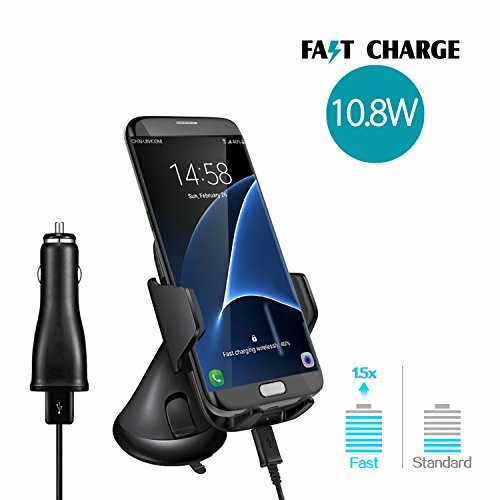 【Fast Charge Mode】: Fast Charge mode(1.5X fast than standard wireless charger) for Galaxy S8, S8+,S7, S7 edge, S6 edge plus and Note 8/5 models. Standard charge mode for Standard Qi enabled devices like iphone X/8P/8. 【All In One Design】: Item includes angle-adjustable air bent mount and bracket base. You can put your phone in different places of car while driving and charge it through wireless charger. It is not only used in your car, but also can be used in your office or room as normal use. 【One Hand Operation】: One Touch lock and release mounting system that locks the device into the holder or release with just the push of a finger. This friendly design also makes phone firmer and ensure its safety when you are driving. 【All Systems Go】: Max.width: 3.5in; Min.width: 2.13in. Package includes dual ports fast car charger(9V/1.67A, 5V/2.1A) and micro usb cable. You can use the wireless charger directly without purchasing other Accessories. 【Premium Support】: Friendly warranty support without any cost needed, worry-free 18-month warranty, fast and easy-to-reach Customer Service to solve your problems within 24 hours. If you have any questions about this product by Sky castle, contact us by completing and submitting the form below. If you are looking for a specif part number, please include it with your message.